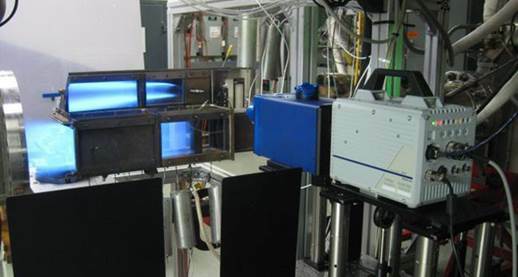 Spectral Energies has led the development of high-speed planar laser-induced fluorescence (PLIF) and particle-image velocimetry (PIV) for investigation of combustion dynamics in augmentors. A typical arrangement for high-speed PLIF in an augmentor test cell environment is shown below, along with a sample OH PLIF image sequence of a global augmentor combustion instability. Figure 1. Schematic of augmentor test facility, including (a) the top view and (b) side view of a v-gutter flame holder. Figure 2. Example of an arrangement for combustion diagnostics in an augmentor test facility. Figure 3. Sample time sequence of high-speed OH PLIF images during a global augmentor combustion instability (flow is left to right).